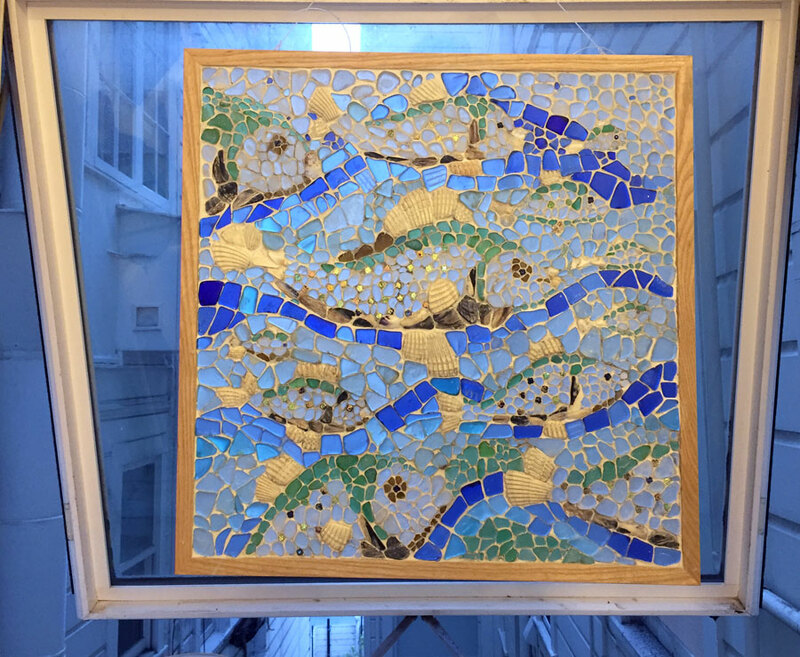 Today I finished a big mosaic, 20″ x20″ beachglass and seashells on acrylic. I realized I had so much beachglass and had made some jewelry but was trying to think of other art projects to use it for. That’s when I began making mosaics. The difficulty of combining transparent and solid materials is that one must consider that the image will change when it is backlit vs when it is lit from the front. So the design has to work both ways. In this case used the shells for the fins and tails of the fish and used larger blue tumbled seaglass for curvy waves. It was sold before it was even finished! Thank you to Neil and Daragh Powers who saw it on my instagram and put dibs on it.